Conservation license plate supporting quail conservation in Texas. As a teen, Kelly Thompson of Fort Worth, cherished time outdoors hunting quail with his friends. It usually involved walking with bird dogs through a variety of habitats, before ever seeing a bobwhite. Sometimes you won’t see a quail all day. Even when the young men never saw quail, Kelly says the fellowship and time in nature was worth it. As it is today. Years ago, many people measured a successful hunt by how many birds you got in your bag. 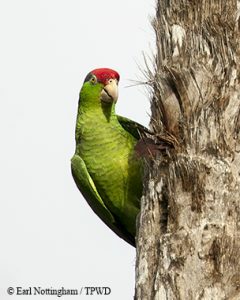 Today we measure success by how many birds you found—not at all how many you shot. As a matter of fact, we’re so much more thoughtful about the conservation aspects of quail than we are about the harvest of quail. It’s much more fun to find them than to shoot them. Yet, quail are declining in Texas, and Kelly wants to reverse the trend. As a member of the Texas Parks and Wildlife Upland Game Bird Committee, he and others worked to get a quail license plate added to the conservation plate collection. 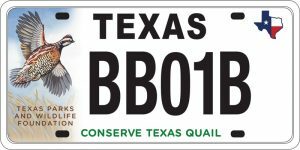 Specialty license plates cost $30; $22 would go to the Texas Parks and Wildlife Foundation [through TPWD] for quail conservation efforts in Texas, including: habitat conservation, education and some small-scale habitat projects. The funds will be directed by a committee of representatives from quail-related organizations, and administered by the Texas Parks and Wildlife Foundation. View the new quail plate at conservationplates.org. Bison Music Fest 2018–tickets on sale now. Tickets went on sale in last month for this year’s Texas State Bison Music Fest. This year’s Bison Fest will be held September 22—that’s a Saturday. And it will be held in Quitaque, Texas, which is the gateway to Caprock Canyon State Park. Donald Beard, Caprock Canyon State park superintendent, says the event—which he calls a street dance—helps to raise awareness of the Texas state bison herd. This bison herd was started by Charles Goodnight in 1878. It’s one of the only remnants of Southern plains bison that are left, and it’s one of the five foundation herds that all bison today are related to. They’re important culturally and historically. 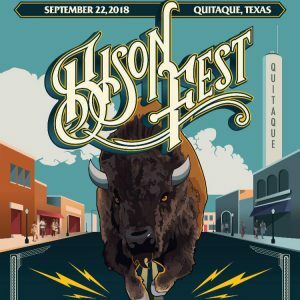 The Texas State Bison Music Fest in downtown Quitaque offers a full day and night of activities and music for the entire family. Starting at about nine o’clock in the morning, we’ll have vendors lined up all up and down main street with all kinds of neat arts and crafts and food and other things to do. But it will be a lot of fun all day long. Music kicks off about three o’clock and will go to about eleven or twelve at night. Find the full music lineup and ticket information for the September 22 Texas State Bison Music Fest at bisonfest.com. Houston has a dynamic culinary scene, where seafood is on the menu. In April, Texas Game Wardens wrapped up a two-year covert operation by issuing more than 150 citations to fish markets and restaurants in the Houston area that illegally purchased game fish from undercover officers. Over the two year period, we approached approximately 40 businesses in the Houston area—restaurants and markets. And I think the final number was 19 purchased from us. So, about 50% purchased. Captain Josh Koenig oversees the Game Warden’s Special Ops Criminal Investigations Division. During the two-year operation, wardens in plain clothes offered to sell more than a dozen different Texas saltwater species to seafood markets and restaurants along the upper Texas coast. The black market fish market is definitely a global issue. The legal folks who are doing everything correct, it could put a damper on them; these illegal fish can change the market, and affect you then when you in turn go to buy fish. So, trying to slow down or stop the black market fish trade is a very high priority. 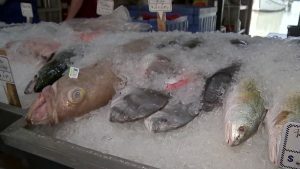 Wardens received tips from sources identifying businesses known to purchase fish under the table. They began approaching them using product seized from other cases. These covert investigations are ongoing. That’s our show, brought to you in part by Ram Trucks…built to serve. 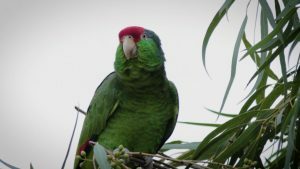 You are currently browsing the Passport to Texas weblog archives for June, 2018.